The angel at Jesus’ tomb proclaims to the holy women “He is not here. 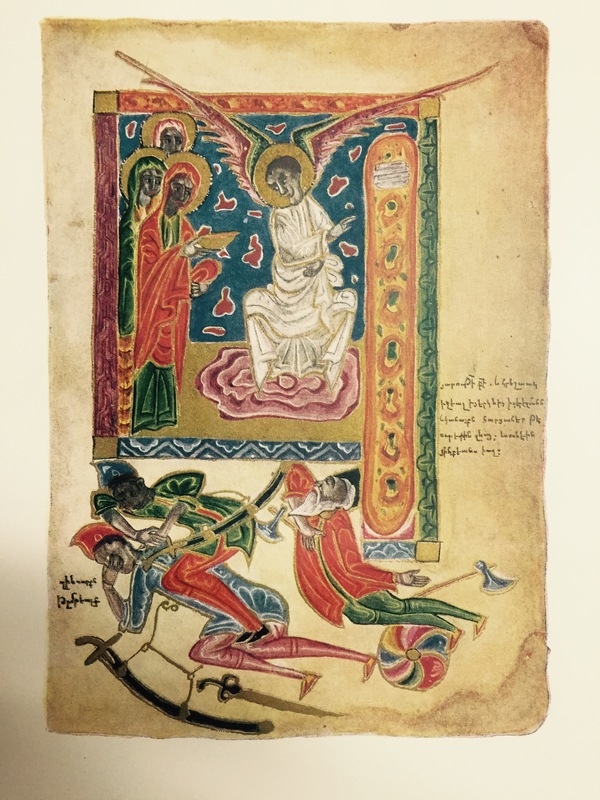 He has risen.” Armenian miniature from Isfahan, Iran, dated 1610. 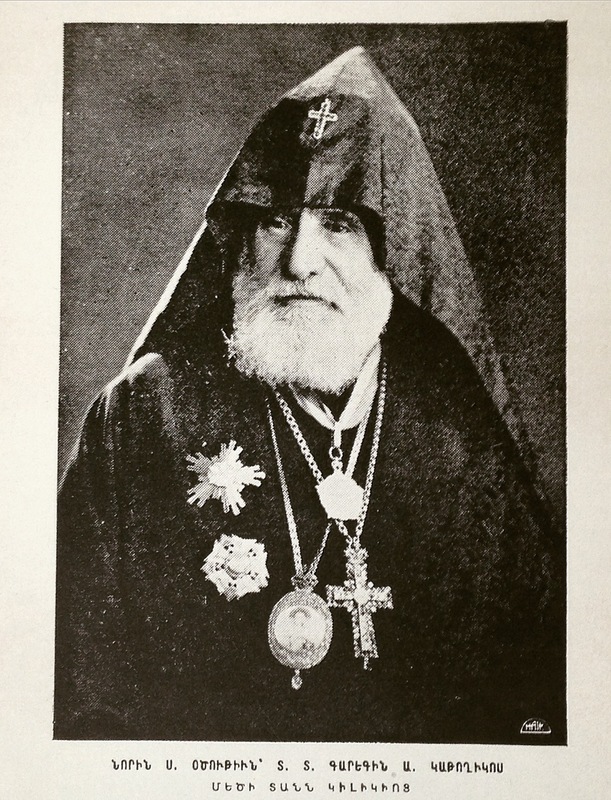 The following Easter sermon was delivered and published in New York in 1938 by then Primate of the Diocese of the Armenian Church of America and later Catholicos of the Great House of Cilicia, Garegin Hovespiants. A scholar, soldier, and man of intense Christian commitment, he escaped the rubble of the Genocide to become one of the great Armenian Church leaders of recent centuries. In this sermon, the Archbishop reveals the relevance of Christ’s Resurrection for the modern, scientific age. Who will roll away the huge stone, the boulder that was placed in front of the tomb? This was the discussion among the women. Taking with them sweet incense and oil, they had come to pay their last respects to the earthly remains of the great Teacher. Just yesterday he was alive, today he was but a breathless corpse, and tomorrow he would forever disappear from their view as a bit of decay and destruction. This final noble deed should have been done with heart and soul. Yet the women were frail and weak. So who was going to help them to roll away the huge stone that sealed off the tomb so that they could have access to the cave? Poor, naïve but holy women. They did not yet know that that very day in history a miracle was taking place by God’s will. New paths to salvation were opening before them to destroy death by means of death, yes, to cripple it. Their eyes would open, their earthly eyes, to see and to understand that it is not possible to destroy the truth by means of falsehood and deception. Jesus’ message about the redemptive and great power of faith would become clear. In the face of that faith mountains moved, boulders were rolled away, rough roads were made smooth, dead bodies were coming to life. It was necessary die, to “die daily” [1Corinthians 15:31] in the name of God, for one’s brother, for one’s homeland in order to receive and to protect eternal values. And there was the key to open the otherwise locked gates to life. The primitive force of Christianity lay there. The early Christians believed that Christ rose, he was alive in the midst of those gathered in his name. He was in their lives and in their hearts. Great moral strength was to be found in the idea of resurrection and in their faith in it. The power to subdue the world consisted in external weakness, poverty, distress. “Henceforth it is not I who live, but Christ who lives in me” [Galatians 2:20]. But the good news announced by the angels is also for us, who thrive in the theoretical and practical science and in the aesthetics of the twentieth century. Science, art, and the miraculous conveniences of modern life have enormous value. They broaden our knowledge, our worldview, our perception of life and of the phenomena of the universe. They refine our appetite for the great satisfaction that comes from learning and from beautiful things. Yet they are not everything and they do not achieve everything. Already St. Paul the Apostle considered science as limited and incomplete. With all of its advances and progress over two thousand years, even today it is incomplete. Nature remains filled with secrets and mysteries, from the most minute biological entities to mankind’s own inner being: our will, the sweep of our imagination, our thought processes and our consciousness. Not only the universe, with its infinite magnitude, remains beyond our comprehension, but also its tiniest, infinitesimal components. Science concerns itself only with external phenomena and things. It discovers mechanical and other laws by which life and the universe move and operate. But as much as it advances and develops, it has not succeeded in penetrating their inner depths. Their cause and purpose remain hidden from science. They remain a mystery. The lamp of faith shines at the edge of this mysterious, unknown frontier. It casts light on our deeper understanding of things and phenomena, discerning an eternal wisdom and purpose to the universe and to our own existence. Everything comes from God and is piloted by God; and our desires and aspirations and our ascent to perfection are all headed toward God. Great scholars and philosophers, scientists and poets—each in their own way—have come to this conclusion when they have moved beyond objective investigation to seek the answers to the great questions of cause and purpose: from tangible realities to the world of spiritual, higher experience; from visible life to its interior essence. This is where the greatest miracle of human life takes place, the harmony of science, art and religion, each in its own way, by its own means, but always serving the very same supreme purpose, which is real life, reborn and refined life—life risen from among the dead and directed toward God. But then the bells of a nearby church resounded and a hymn glorifying the Resurrection echoed. Seized by the moment, he lowered the cup and set out on the path of a new life—complete with its ups and downs—his eyes always directed toward the heavenly and the sublime. O that sweet sound of a rational bell, which is God’s voice, the invitation from death to rebirth, toward the life of the Resurrection! Translated by V. Rev. Fr. Daniel Findikyan from Garegin Catholicos Hovsepiants, Դէպի լոյս եւ կեանք [Toward Light and Life]. Printing House of the Armenian Catholicate of Cilicia (Antelias, Lebanon, 1947) pp. 153-155. Originally published in Հայաստանի կոչնակ, 1938.